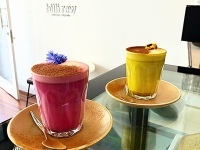 Try our own blend coffee or exotic drinks such as the Turmeric and Beetroot Lattes. Orange Juice, Frappes and Smoothies are also freshly made. Breakfast & Lunch both contain lovely and fresh options. Eggs, Pancakes, Wraps, Salads and much more with options of Vegan, Paleo, Gluten and or Dairy Free. 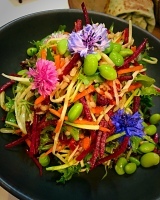 "We believe in the power of SuperFoods that help nourish your mind, body and soul and that every meal should not only look good, taste good, should also be good for you.